A Programmable Logic Controller (PLC). An Internet of Things (Iot) Device. A database or other type of data source. Reading data from the data source. Generating alarms if any permanent communication errors are detected. Extracting data relevant to the associated IO Data Point Tags. Sending write requests to the IO Data Point Tags back to the data source. Note: Not all drivers support writing back to the data source. Some other drivers provide an interface to an external service. For example the Message Services driver provides a connector to an SMTP Relay to send emails from Fernhill SCADA. All data read from external data sources is available to other applications through the Data Access interfaces. You manage Tags using the Tag Window in the Configuration Tool. All tags are built from a common set of Tag Components. Each driver provides a set of tags which build on the common set of properties to provide more specialized features. Allen Bradley 2.2 Yes Communication channel tags, PLC tags and register block tags to communication with Allen Bradley PLCs. Map I/O Data Tags to register addresses in Allen Bradley PLCs. Core 1.0 Yes Internal data tags, I/O data tags, and calculated tags. Alarm Tags. Tags to schedule IEC-61131-3 Programs. Data File 1.6 Yes Tags to represent an external data file. The driver maps I/O Data Tags to values in the external data file. Idec Micro 2.1 Yes Communication channel tags, PLC tags and register block tags to communication with Idec Micro PLCs. Map I/O Data Tags to register addresses in Idec Micro PLCs. Message Services 3.23 Yes Alarm routing. Text report generation. SMTP Email connector. Mitsubishi Melsec 1.1 Yes Communication channel tags, PLC tags and register block tags to communication with Mitsubishi Melsec PLCs. Map I/O Data Tags to register addresses in Mitsubishi Melsec PLCs. Modbus 1.0 Yes Communication channel tags, PLC tags and register block tags to communication with Modbus PLCs. Map I/O Data Tags to register addresses in Modbus PLCs. Modbus Slave 3.10 Yes Maps Fernhill SCADA tags to the Modbus address space and accepts commands from external drivers. MQTT 3.22 Yes Maps Fernhill SCADA I/O Data Tags to topics in one or more MQTT Servers. Odbc Client 1.2 Yes Execute commands on databases using ODBC. Map I/O Data Tags to the result set of a query. Omron 1.0 Yes Communication channel tags, PLC tags and register block tags to communication with Omron PLCs. Map I/O Data Tags to register addresses in Omron PLCs. OPC Client 1.3 - Read data from and write data to OPC Data Access Servers. Random 1.0 Yes Update tags from a random number generator. Siemens S7 1.4 Yes Communication channel tags, PLC tags and register block tags to communication with Siemens S7 PLCs. Map I/O Data Tags to memory locations in Siemens S7 PLCs. SNMP Client 1.3 Yes Read data from an SNMP agent. 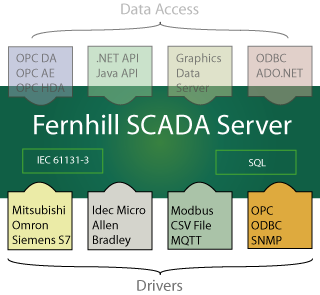 The Version column gives the version of Fernhill SCADA required to support the corresponding driver. The Linux column indicates whether the driver is supported on the Linux version of Fernhill SCADA. To learn about the configuration tool.